If you're of a certain age, you definitely remember booting up your MS-DOS computer and typing in the commands to start what might have been the best game ever. 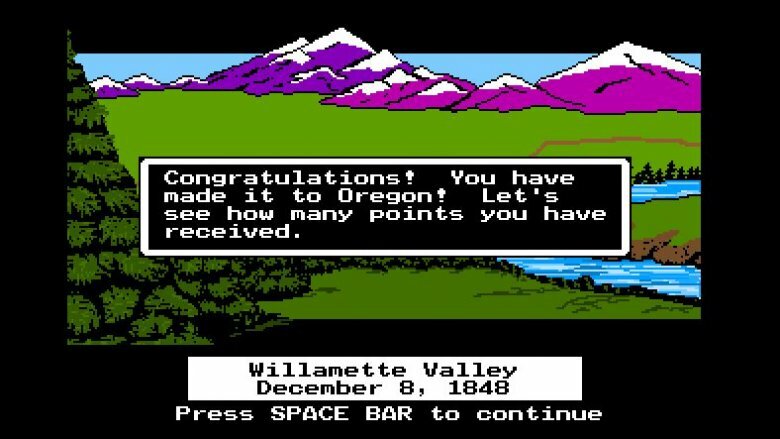 It was, of course, The Oregon Trail, and it was extra-awesome because it totally allowed you to get away with playing a game as part of your schoolwork. Those graphics! That music! It was nothing short of an epic adventure, but how has it aged? We're pretty sure it might be nostalgia alone that made it fun to play again, but let's talk about some of the things we noticed now that we definitely didn't notice then. You totally never paid attention to this as a kid, did you? You probably wanted nothing more than to type your name — or pseudonym of choice — into the Top Ten list at the end, especially if you were playing on a shared computer in the lab. Getting on that list was better than getting a trophy in those trophy cabinets because who pays attention to those things? If you'd clicked around in the start menu instead of just going straight to hitting the trail, you would have found the screens that explain just how you're scored at the end. You get points based on how many people in your party survive, and how healthy they are. Being in good health netted you 500 points while very poor health was only worth 200, so why not stop and rest when you're within spittin' distance of the end? You also got points for each item you finished with, but the real points came if you didn't just go with being a banker. You'd get double points for picking carpenter as your occupation and triple points if you were a farmer, and the game's justification wasn't just rewarding you for having less money at the start. They slipped some history in here, too. The West didn't really need more bankers, but it did need people with practical skills, like farming. That's the real (sneaky-historical) reason you got the bonus points. No matter how much food you bought, you always seemed to run low somewhere around the midpoint of the game. That's OK because you could take your little bald self hunting in what was an awesome little mini-game. They were different times. No matter how much you killed, the game would only let you carry 100 pounds back to your wagon and your cholera-ridden, accident-prone family. At the time, it seemed like a weight restriction based on the logical amount your little bald, red-shirt dude could carry, but as an actual adult, you might wonder why it let you keep killing. Pretty wasteful, right? A stupid thing to teach a kid, right? It's also an accurate depiction of what happened on the trail — and across the West — as humans stampeded their way through nature that had done just fine for centuries under the stewardship of the Native American tribes who called it home. We had what was called the Myth of Superabundance, and it basically said there was so much good stuff in the western part of the U.S. that we could kill whatever we wanted and it wouldn't matter. Spoiler alert: it totally mattered, and when your 10-year-old self was gleefully shooting everything that came in range, you were reenacting what your terrible ancestors once did to real animals. Did you ever bother to actually talk to some of the people you met along the way, or did you just speed on through to the end? If you had stopped to chat, you would have gotten three different responses at each stop along the way. Some of them were real people, and their responses were based on actual things that happened along the trail. You were learning things and you didn't even know it. One of the names that pops up a few times is Marnie Stewart, and her diary is part of the Oregon Trail documents at the Lane County Pioneer Historical Society. More properly Helen Marnie Stewart, the Pennsylvania-born Marnie traveled the trail in the 1860s with a party that had selected the carpenter option. For real (via Oregon Pioneers). Alonzo Delano shows up a few times to give some advice, too, and he published a book about his experiences on the trail, California As I Saw It: First-Person Narratives, 1849-1900 (via the Library of Congress). They knew what they were talking about, you just weren't listening. When you stopped at Ft. Laramie, you talked to one woman who recommended not digging for water and only drinking river water. It made sense. Whatever badness ended up in the river was moved right along … wasn't it? The unnamed woman mentions the Platte River by name, and says it's better to drink salty-tasting water than to get cholera. That's true, but drinking water from the Platte River was almost guaranteed to give you cholera. It's one of the most messed up things that happened along the trail, and it was largely thanks to the Mormons, best intentions notwithstanding. When they set up a ferry to see people safely across the river they created a log jam of people waiting to cross, and while they waited, nature didn't. There were tons of people and animals heeding the call of nature right into the Platte River, so drinking that river water? Terrible advice, and it's not salty for the reason she seems to think it's salty. 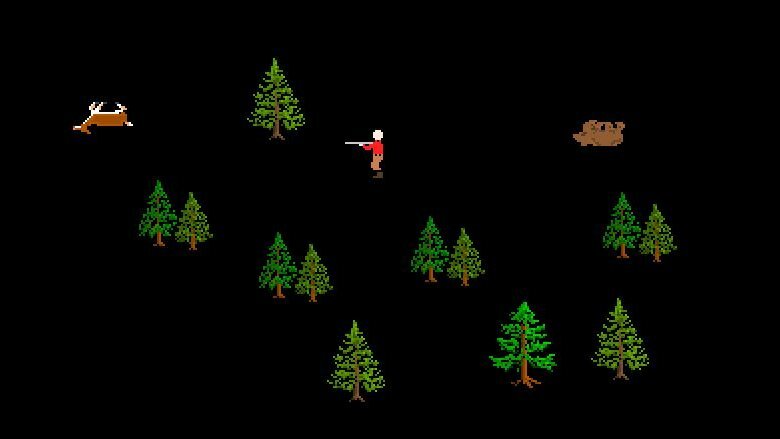 You probably relied on hunting to get you through the last half of the game. 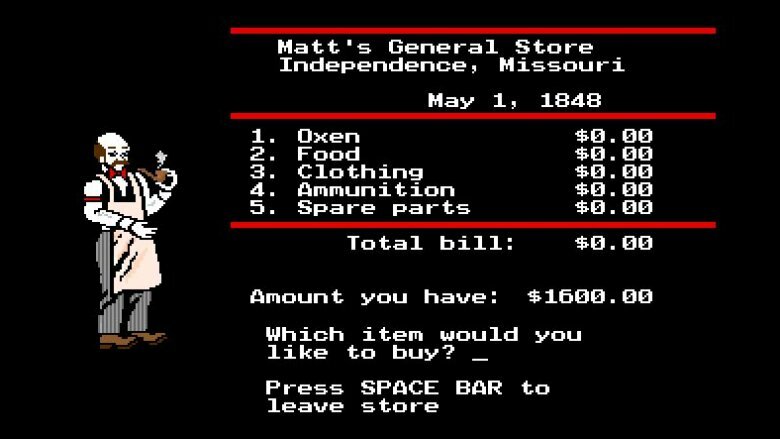 Sure, you could buy food, but 10-year-old you had no clue what a budget was and blew all the starting cash on oxen and bullets because that made sense, right? If you were observant, you would have noticed you could easily maximize your hunting trips to spend one or two bullets to get that 100 pounds of food. (And saving time was important — it would keep you out of the snowstorms later.) Wait, what's the trick? The color of the ground changed based on the kind of terrain you were on, and the animals that showed up were based on terrain. Wait until you for green prairie and you'll get buffalo, and don't hunt in the desert. Don't believe us? 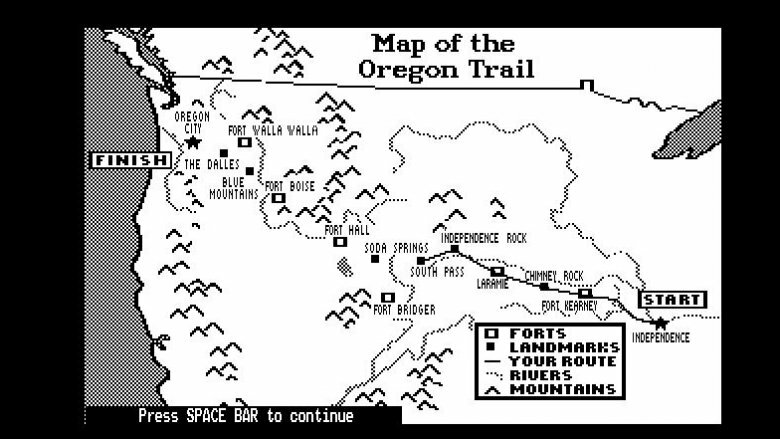 We're not making it up — it's in the instruction manual that came with your Oregon Trail diskette. You know, the manual your teacher took away because it was more fun to watch you try to figure it out yourself. Because, let's face it, the way Native Americans have been depicted in countless movies and television shows is pretty cringeworthy. 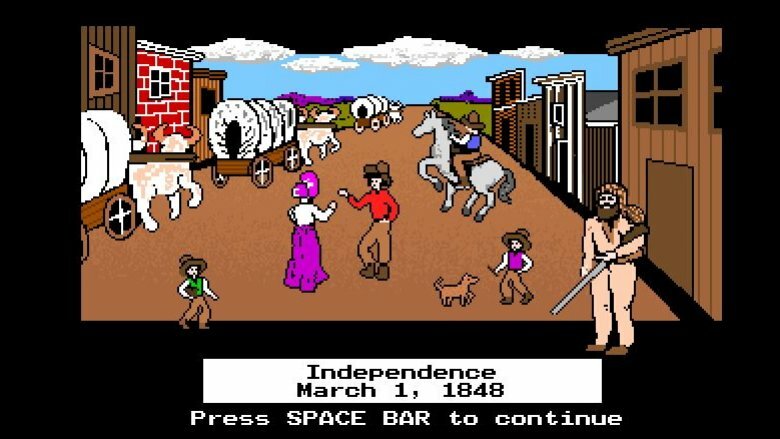 Hollywood may have bought into the massive smear campaign when it comes to depicting the interactions between settlers heading west and the tribes of people already living there, but you probably didn't even notice The Oregon Trail tried to tell you the truth. 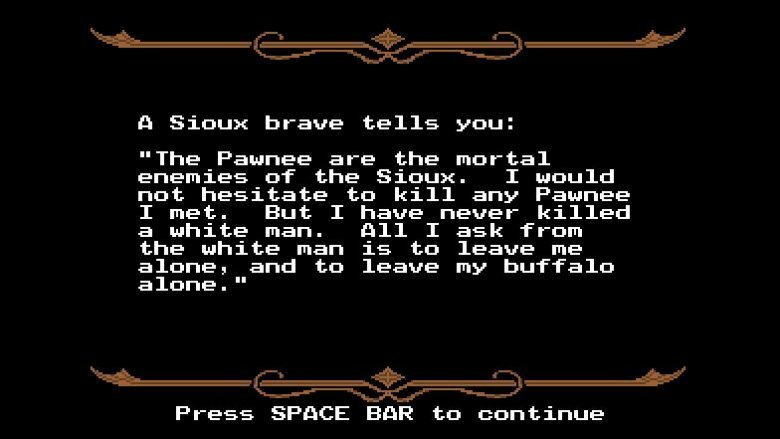 Every so often, you'll talk to a Native American when you're on the trail, and the things they say are just heartbreaking. One Arapaho says, "When the white man first crossed our lands their wagons were few. Now they crowd the trail in great numbers. The land is overgrazed with their many animals. Do any white men still live in the East? My people talk of moving." It's like buying a quiet piece of property because it has a complete lack of neighbors and having the state put a highway in your front yard. A few people pop up with sentiments echoing that one, talking about the destruction the wagon trains brought with them. That's pretty heartbreaking stuff, but hey, at least someone got their history right. Right, don't lie. How did you name your party? Were they the friends and family you really would have set off with? Or were they people you actually pretty much hated? It was the latter, wasn't it? It was for us, because even if we didn't know the word "schadenfreude," we definitely knew the feeling. Even if you had the vaguest sort of idea that your party members were contracting potentially deadly diseases, there was still a bit of giggling going on when Johnny the Troll-Boy came down with a case of cholera. It's only as a grown-up that you realize how devastating these diseases could be, and what you were really laughing at. Cholera is still no joke, as the World Health Organization says it still kills as many as 143,000 people a year with violent diarrhea. Dysentery is still around, too, and even though it's less deadly, the NHS heavily implies the vomiting isn't really that funny. 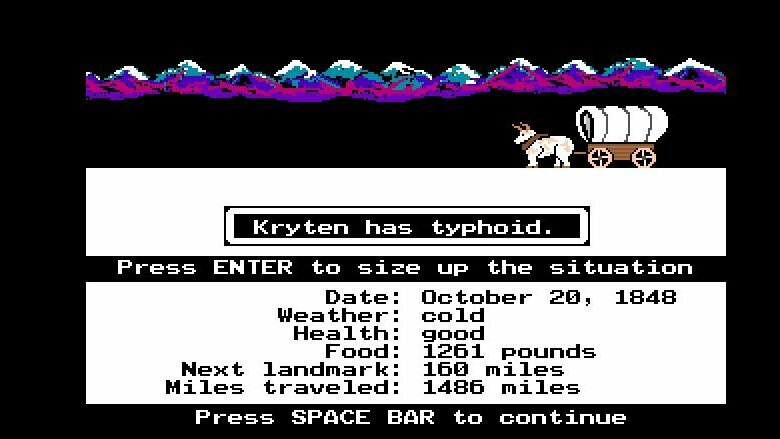 Typhoid ain't gone. That starts with a fever, and according to the CDC, it's typically treated with antibiotics, but it's getting more and more resistant to our standard round of antibiotic treatments. 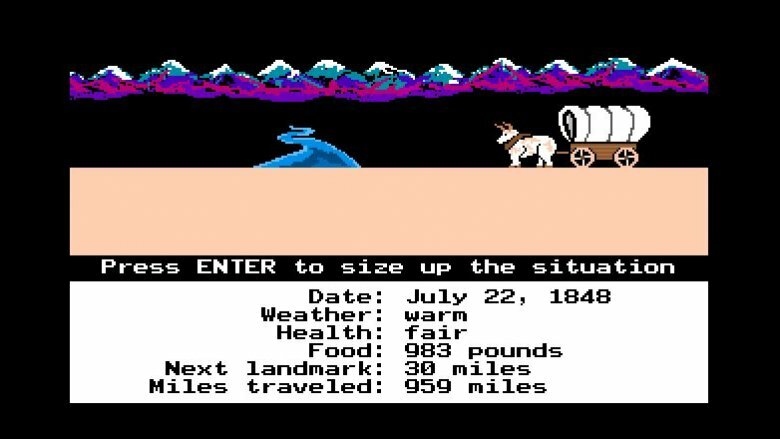 It could be The Oregon Trail all over again if things keep going in that direction, and it's probably not so funny in real life. Oh, the innocence of childhood. 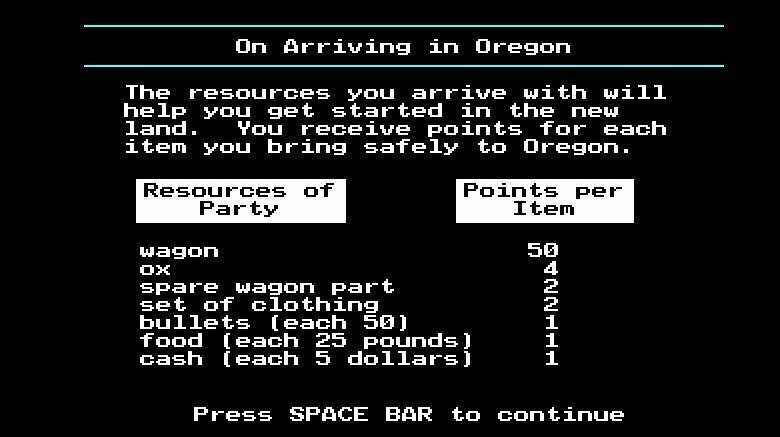 The first time you played The Oregon Trail, you were probably still functioning on what we like to call The Santa Claus Mentality. The good boys and girls would get good things — and presents — while the bad boys and girls would get what was coming to them. 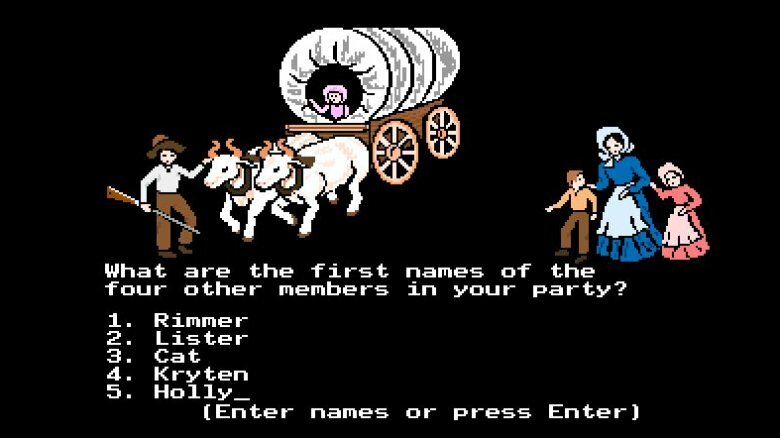 There's not many people who would lump themselves in with the bad, so when we'd randomly break our wagons, have oxen that were first injured then dead, or when we lost some pretty valuable time after getting blindsided in a snowstorm, it was infuriating. There was just no reason for it, and that was a hard thing to accept. It was also a completely accurate depiction of adulthood, we were just fortunate enough not to know it at the time. Sometimes, dysentery just happens. (And when it does, it's usually pretty explosive.) All those random broken arms, broken wagon wheels, and illnesses were really preparing you for your grown-up existence, and it's probably a good thing we didn't know it at the time. Even if your Top Ten list has been replaced with names like "IWUZHERE" and "MADMAX," you still have the option to view the original list. It's filled with names that seem vaguely old-timey, for good reason: they're actual people. Stephen Meek takes the top spot, and he's earned the title of Trail Guide. 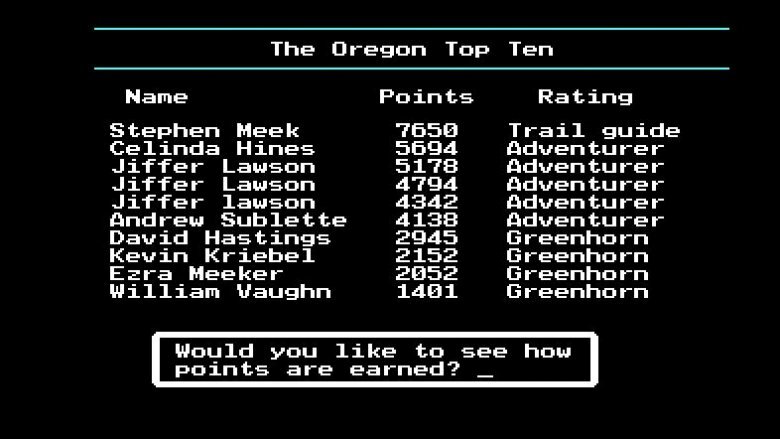 He really did, because according to the Oregon Historic Trails Fund, Meek pioneered the unimaginatively-named Meek Cutoff. Determined to find a direct route across the Cascade Mountains, he led somewhere around 1,000 people in 200-odd wagons along his cutoff route to The Dalles, losing only 23 people along the way. Sounds decent, but the entire trip was plagued with so much illness and a complete lack of water that everyone who talked about him pretty much condemned the idea as a failure. Until, that is, the eternally hopeful retraced his steps in hopes of finding some of the gold his party had discovered but was too thirsty to care about. But that was in there, too, and it started in Matt's General Store. Matt is actually a bit of a smug dude, with his pipe and his creepy, beady-eyed stare. You get that now, when you realize he was making a fortune off people getting ready to head out on the trail. All the oxen, food, clothing, ammunition, and wagon wheels he must have had in stock … and you had to figure out what you really needed with your limited budget. Play a few times, and you'd know things got more expensive the farther along the trail you got, so you'd better plan ahead. Turns out it was more like real, grown-up life than we were prepared for. 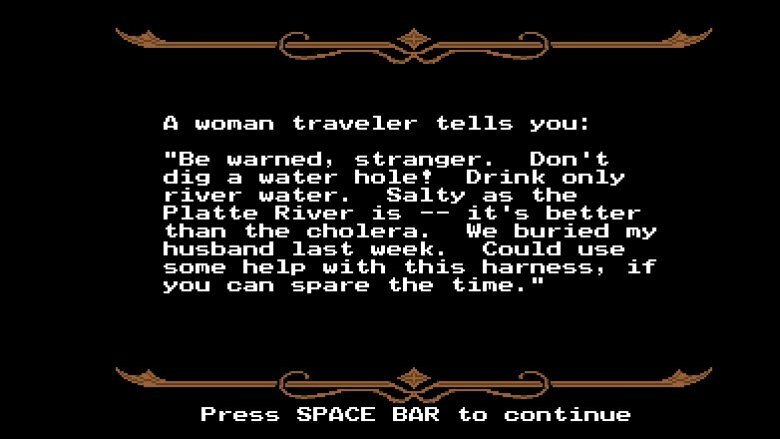 Kids of any age get some of the basics when it comes to status and class, but The Oregon Trail features some social commentary that's so sneaky it might not even have been intentional. The makers couldn't see into the future to the state of our 21st-century world (that we know of), but that makes this even cooler. In 2015, The Atlantic posted a commentary wondering what the heck was going on with America's employment trends. At the same time 17 million people were out of work, there was a serious shortage of skilled laborers. That's not just an American problem, either. In 2017, The Guardian looked at the problems that were going to face a post-Brexit U.K. that loses a huge number of its skilled workers to the EU. What does this have to do with The Oregon Trail? Just like the game, the world doesn't need more bankers. It needs carpenters and farmers, but choose either one of those occupations and your life is going to be harder from the start. And that's not the slightest bit fair. You shouldn't be penalized for choosing a trade that's more practical and way more useful, and at least at the end of The Oregon Trail you get compensated for suffering through the hardships with some extra points. Let's hope that's the case in the real world, too.